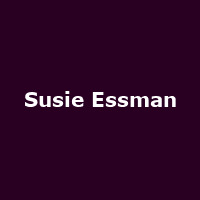 Susie Essman is an American stand-up comedian, actress, writer and TV producer, best known for her role Susie Greene on the improvised hit comedy series "Curb Your Enthusiasm". "Susie's streetwise vernacular is perfectly suited for her life in Manhattan where she has been a veteran of the world of stand up comedy for twenty-nine years. She has appeared in her own half-hour HBO comedy special, made numerous appearances on Late Night with Conan O'Brien, The View, and Crank Yankers, to name just a few of her many television credits."